Madison Square Garden, often called "MSG" or simply "The Garden", is a 20,000-seat multi-purpose indoor arena in the New York City borough of Manhattan, located near other midtown Manhattan landmarks like the Empire State Building, Koreatown, and Macy's at Herald Square. The Garden opened on February 11, 1968, and is the oldest major sporting facility in the New York metropolitan area. It is the oldest arena in the National Hockey League and the second-oldest arena in the National Basketball Association. In 2016, MSG was the second-busiest music arena in the world in terms of ticket sales, behind The O2 Arena in London. 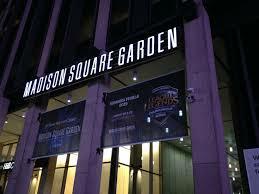 It is home to the New York Rangers of the NHL, the New York Knicks of the NBA, and the New York Liberty of the WNBA. Madison Square Garden is the last of the NBA and NHL arenas to not be named after a corporate sponsor. In addition to professional basketball and ice hockey, the venue is known for hosting high-profile events for boxing, concerts, ice shows, circuses, professional wrestling and other forms of sports and entertainment. The Madison Square Garden ticket office is open Monday - Saturday from 10 AM - 6 PM. Will Call tickets are available for pick up on the day of the event.